Stephanie Sigman's Mexico City The S.W.A.T. star shows Watch! the sights in one of her favorite escapes. I moved to Mexico City when I was 16 years old," says Stephanie Sigman, who plays Captain Jessica Cortez on CBS's hit show S.W.A.T. "Mexico City literally has it all, so coming from a small town like Ciudad Obregón in Sonora was a huge change for me. It was fun!" The former Bond girl now spends her days filming in Los Angeles, which she says reminds her a lot of home. "L.A. and Mexico City are very similar in the sense that you can make your own version of it," she notes. "You can live where everything happens, or you can be surrounded by trees and birds, have amazing restaurants and concerts to go to, and find all types of amazing art shows." A map of Stephanie Sigman's hometown of Mexico City. Illustration by Nik Neves & Nina de Camargo. We caught up with Sigman during one of her trips back to the buzzy ciudad and asked her to give us the lowdown on what to do, see, and most especially eat in the City of Palaces. 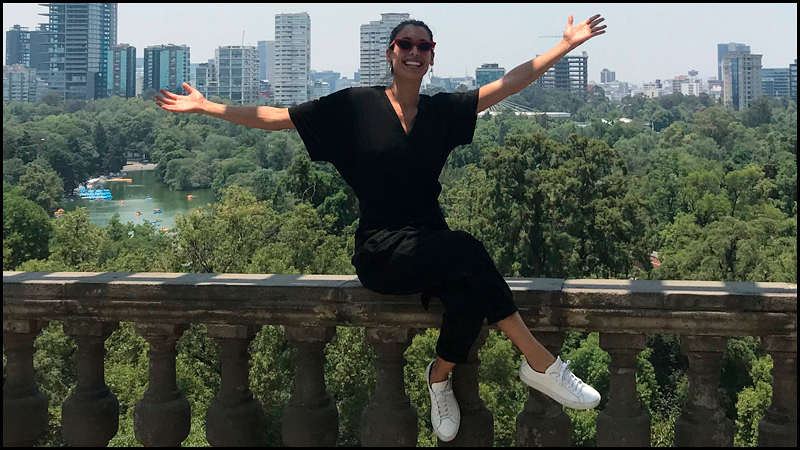 Stephanie Sigman on a recent visit to Mexico City. The main reason I'm in Mexico City is to see a play [at Teatro Milán] called Los Hijos También Lloran, based on a book my friend Andy Zuno wrote. He stars in it and produces, too. The theater here is very good, but you have to understand Spanish. 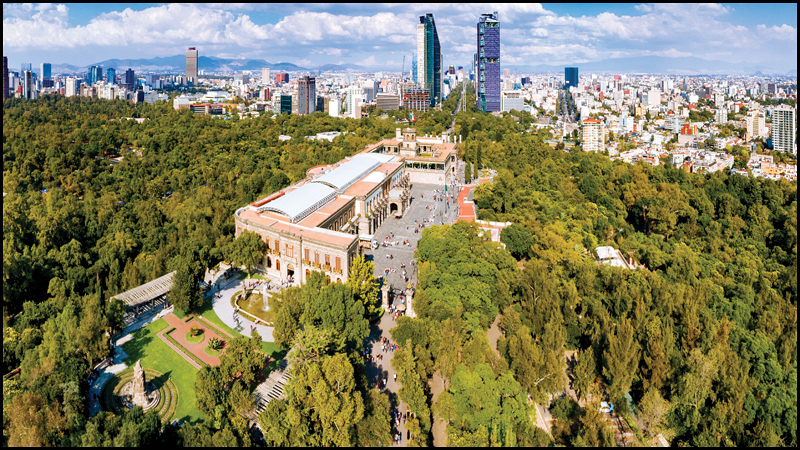 Aerial view of the Castillo de Chapultepec. I'm also heading to the Castillo de Chapultepec. It's a very historic place with really amazing views, and they have a museum inside. 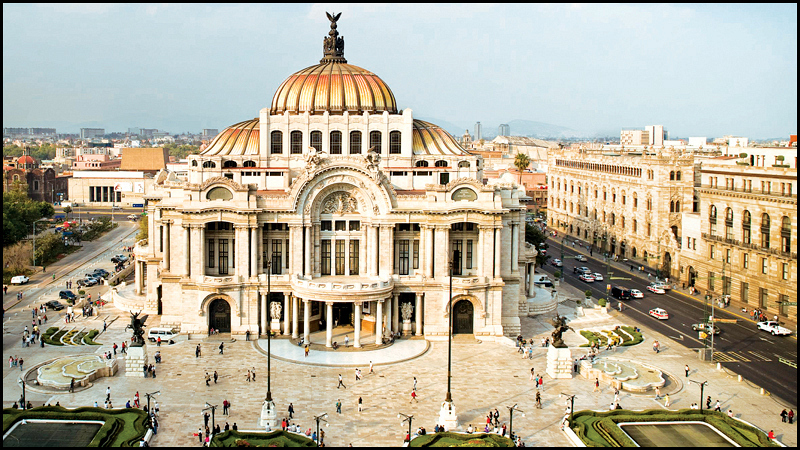 For art, go to Palacio de Bellas Artes and the Museo Universitario Arte Contemporáneo, or MUAC. Or just explore. 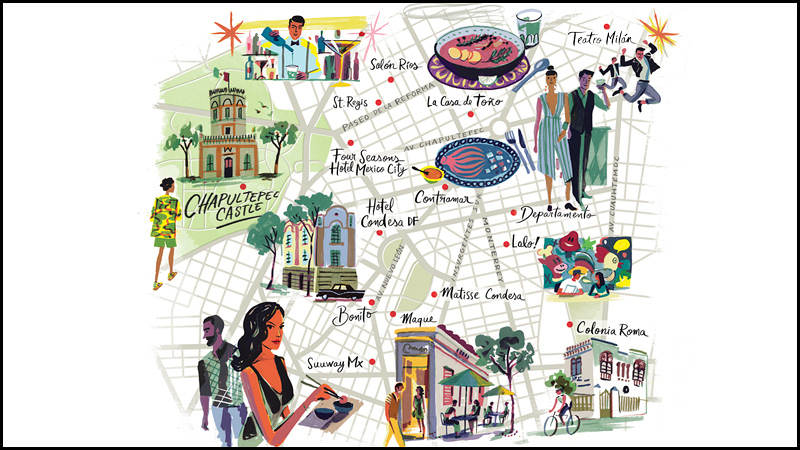 My two favorite areas are Coyoacán and Colonia Roma. Mexico City's famed museum Palacio de Bellas Artes. I don't go out as much as I did when I was younger, but when it comes to nightlife, Salón Ríos in Cuauhtémoc and Departamento in Roma are fun places to have a cocktail. That said, a lot of people go to restaurants and just stay there. Like yesterday, I went out for dinner and we stayed three hours just talking and having drinks. That's the big cultural difference between the States and Mexico. A signature cocktail at Salón Ríos. Do not diet in Mexico City! This morning, for example, I went to Maque in Colonia Condesa. I ordered omelet of flor de calabaza; it's an omelet with beans and chilaquiles, which is pretty amazing. For breakfast, I also like Lalo! for chilaquiles and French toast (pictured below), and Matisse for conchas. Lalo! 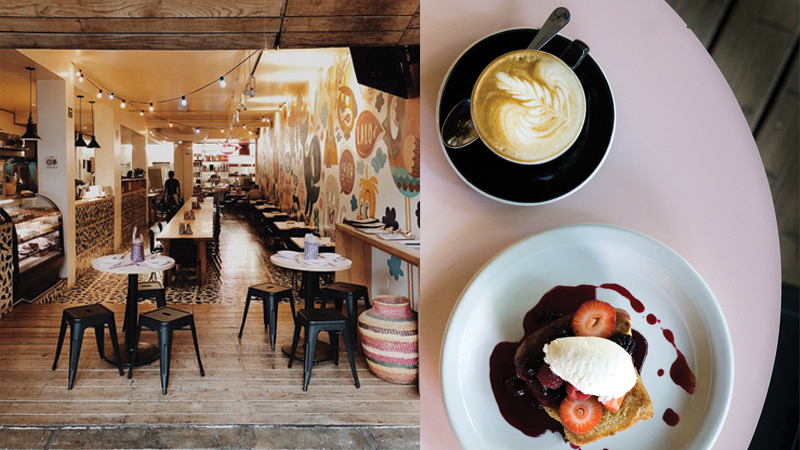 is one of Stephanie Sigman's favorite breakfast spots in Mexico City. I love seafood. 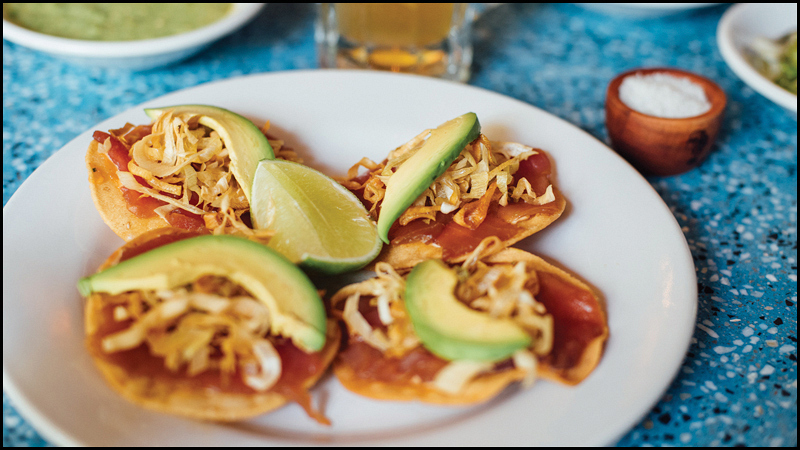 Contramar is a favorite—tuna tostadas! And Bonito, in the neighborhood of Condesa, has great stuff. I ordered quesadillas with plátano macho. For traditional Mexican, try La Casa de Toño; for steak, head to L'Entrecôte; and for Asian fusion, go to Suuway. The pho is great! Tuna tostadas, one of the delicious dishes you can enjoy at Contramar. If you're looking for high-end shopping, go to Avenida Presidente Masaryk in Polanco. For authentic Mexican shopping, try Coyoacán Market. It's more like street shopping than a store, with everything from earrings to sweaters. Eat some grasshoppers as a snack—great protein! 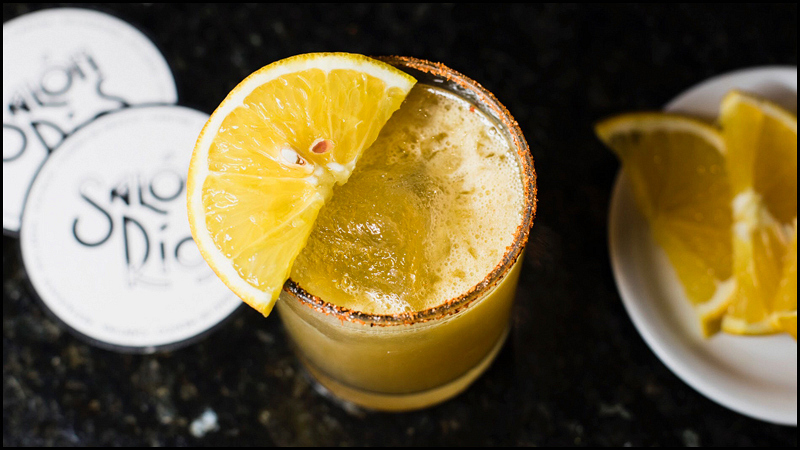 For souvenirs, buy some spicy Mexican candy and a bottle of mezcal—I like Bruxo, Montelobos, and Amores. 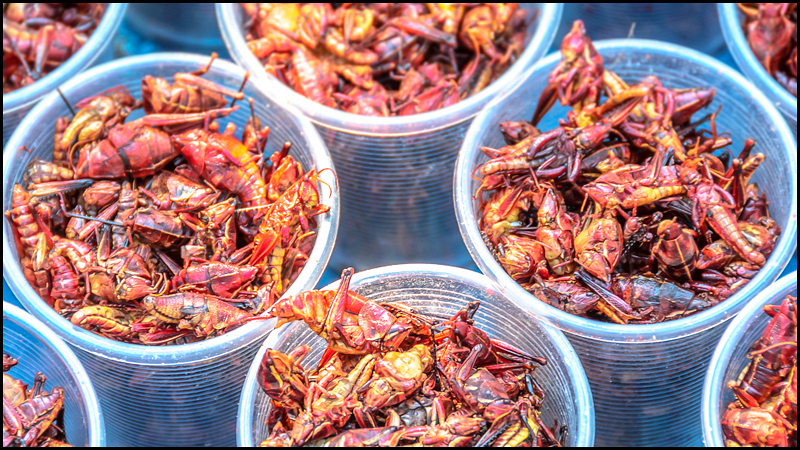 Chapulines or roasted grasshoppers are a traditional snack you'll find in Mexico City's Coyoacán Market. 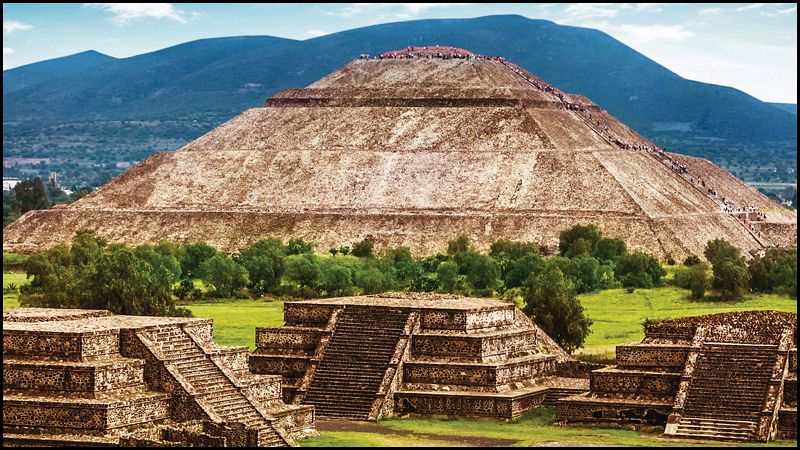 The pyramids of Teotihuacan are a very special place energy-wise. The history. The view. They are very powerful. It's hard to climb all the way to the top, but the photos are worth it. A UNESCO World Heritage Site, the ancient city of Teotihuacan was one of the most powerful cultural centers in Mesoamerica. My favorite hotels are the St. Regis, Four Seasons, and Condesa DF. Their locations are really cool because you can walk basically everywhere. One thing I love about this city is that there are so many areas where you can walk! 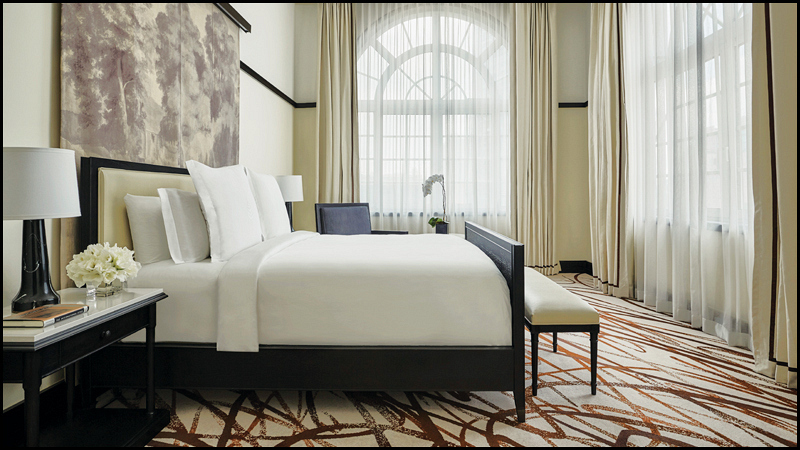 One of the beautiful rooms at five-star hotel St. Regis Mexico City. In some towns, Día de los Muertos [Day of the Dead] is a massive celebration, but in others, like my hometown [Ciudad Obregón], it's more of a school activity to build the altar, more of a family tradition. It varies from town to town, but it's a very important day and a very visual celebration. It's hard to explain what makes it so special. Watch Coco the movie! 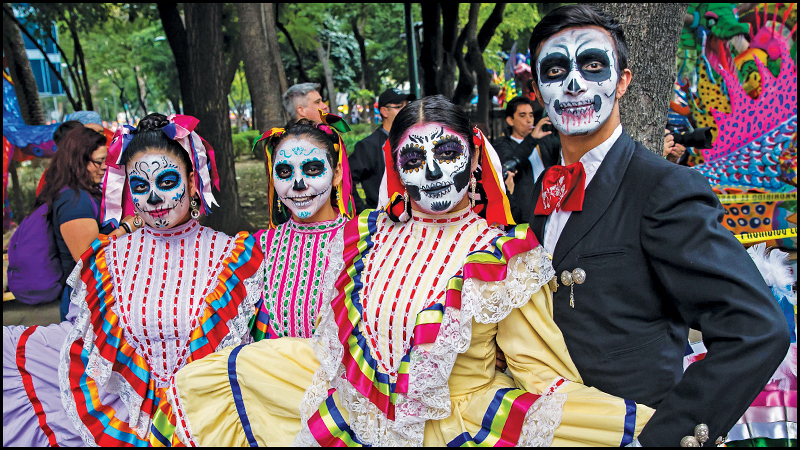 A traditional Día de los Muertos celebration in Mexico. Photo Credits: Art Partner Licensing (Sigman); Nik Neves & Nina de Camargo (Illustration); ferrantraite/Getty Images (Castillo de Chapultepec); Mexican Tourism Board (Palacio de Bellas Artes); Courtesy Salon Rios (Drink); Mariana Cárdenas (Lalo! Interior); Courtesy Lalo! (French Toast); Courtesy Contramar (Tuna Tostadas); agcuesta/Getty Images (Grasshoppers); Anna _Om/Getty Images (Pyramids); Courtesy St. Regis (Hotel Room); Vincent Isore/Getty Images (Día de los Muertos). Watch the Season 2 premiere of S.W.A.T. on Thursday, Sept. 27 at 10/9c on CBS and CBS All Access.